After researching many books on High Dynamic Range (HDR) photography. I settled on David Nightingale’s book. Besides the excellent reviews on Amazon.com and other websites, the approach of using three programs (Photoshop CS4, Photomatix Pro and FDRTools) to show how to create HDR images sold me. The detail he goes into on how to create HDR from taking the photos, doing the HDR processing and final post-processing was enough to get me from guessing at HDR processing to knowing how to make HDR images. I will be doing a full book review but was too excited not to share this with you now. Price: $16.47 US plus shipping. This entry was posted in Photography and tagged book, david nightingale, hdr, high dynamic range, practical hdr. Bookmark the permalink. Sounds awesome, Scott! Looking forward to the full review! 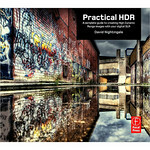 Sounds like a much needed book on HDR, and one I’d be interested in as I do dabble with Photomatix Pro HDR. I don’t use Photoshop; however, I do apply whatever steps are used in Photoshop with the Corel Paint Shop Pro X2 and Corel Painterr 11 that I use… works great. I’ll be putting this book on my wishlist. I look forward to a full book review. Anna, you’ll be able to use the Photoshop stuff he talks about in post-processing. I do the same for Aperture. Photomatix is what you want to use for the HDR processing part. CS4 isn’t as good for HDR anyway. Nice post, I’ve seen a few snippets from the book and most definitely on my buy this soon list. Looking forward to the full review! Hi, Joe! Thanks for stopping by. Nice blog! The front cover photo looks great.